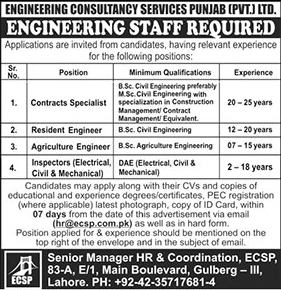 Engineering Consultancy Services Punjab (Pvt.) Ltd. Lahore Punjab. Candidates may apply along with their CVs and copies of educational and experience degrees/certificates. PEC registration (where applicable) latest photographs, a copy of ID Card, within 07 Days from the date of this advertisement via email (hr@ecsp.com.pk) as well as in hard form. Position applied for & experience should be mentioned on the top right of the envelope and in the subject email. ECSP, 83-A, E/1, Main Boulevard, Gulberg-III, Lahore.